House Minority Leader Nancy Pelosi and Attorney General Eric Holder have joined together in a proposal to punish the State of South Carolina, and its governor, Nikki Haley, by grounding them for the next 30 days. The two have submitted a proposal to President Obama requesting that South Carolina be grounded for a period of not less than thirty days. The two political leaders have expressed differing concerns about what they see as the state’s continuing defiance of federal statutes. In an interview on CNBC’ with Maria Bartiromo yesterday, Leader Pelosi was especially critical of the right-to-work state’s support of Boeing in their efforts to operate a non-unionized aerospace manufacturing facility in Charleston, SC. 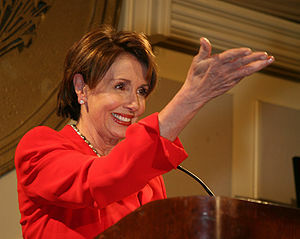 Ms. Pelosi went on to say that she preferred the plant would unionize, but, if it did not, the National Labor Relations Board would be correct in shutting down the manufacturing facility where Boeing plans to build its new Dreamliner aircraft. Boeing is currently defending a lawsuit filed by the NLRB on the issue. Separately, Attorney General Eric Holder’s Justice Department filed a lawsuit yesterday to stop South Carolina’s stringent new immigration law, arguing that the legislation that requires law officers to check suspects’ immigration status is unconstitutional. Governor Nikki Haley was also named in that lawsuit. Meeting together late Monday evening, Attorney General Holder and Leader Pelosi drafted a proposal to the White House for an executive order to ground South Carolina for a minimum period of 30 days. Dreadmonger has attempted to reach the White House for comment on the proposal but they have not returned our phone calls. Luther Melly, Assistant to the Vice-Undersecretary of the Department of the Interior, said today that the Department has created contingency plans to ‘repurpose’ the newly completed Boeing aircraft manufacturing facility in Charleston, SC. The plans, which would be initiated if and when the National Labor Relations Board is successful in their lawsuit against Boeing, would create a new, dual-purpose use for the facility. Dreadmonger reporters from our Southern Bureau, went to Charleston today to seek comment from Boeing, from the Catawba Indian Nation, and from local officials. All declined our repeated requests for comment. Our reporters were able to speak with a group of protestors picketing in front of the Boeing plant in Charleston. The group, which carried signs bearing the acronym, “RNTTT”, spoke briefly with Dreadmonger reporters. “We represent the RNTTT and we are here to demand our rights to open and operate a casino right here in this building,” said a spokesman from the group who would only identify himself as ‘Red”. The RNTTT, or Red Neck Trailer Trash Tribe, is a group of self-appointed “Native Americans” who are petitioning the US Government for the right to open their casino on the Boeing site. Governor Nikki Haley, was briefly on site to hear what protestors had to say. She initially declined to respond to questions from Dreadmonger reporters. The Governor stopped, turned, and paused for effect. “We’re thinking of ‘repurposing’ our cannons and firing on Fort Sumter again,” she said. With that, Governor Haley turned and left the scene.